Hindus all over the world are just about to culminate the celebration of their most significant religious festival, the Navaratri. The festival was originally observed for nine days and nine nights, but recently, it has been extended to ten days with a grand culmination of the celebrations on the tenth day For 2012 the celebrations started on Tuesday, the 16th of October and continued for 9 days until Wednesday, the 24th of October. It is a colorful festival that honors the Shakti, or cosmic energy of Mother Goddess Durga, whom Hindus believe to be the nurturing expression of God/Shiva. Durga provides everyone with all the spiritual and material blessing needed to overcome the difficulties in life and so during the Navaratri, Hindus worship her and call on her to provide for them. The meaning of Navaratri in Sanskrit is “nine nights,” which is the number of days that the festival is celebrated and the number of forms that the Mother Goddess is believed to manifest. It is also believed to symbolize the nine days and nine nights that Durga battled with the evil force Mahishasura. Thus, Navaratri also commemorates the victory of good over evil. Another belief as to why Navaratri is celebrated for nine days and nine nights is that Shiva allowed Durga to visit her mother for only nine days and nine nights; she had to go back on the tenth day. This is also said to be the reason that the festival honors the motherhood of God. The Hindus celebrate Navaratri five times during the year, at the beginning of every summer and winter and during the waxing phases of the moon. The most important celebrations, though, are the Vasant Navaratri and the Sharada Navaratr, which are celebrated in the spring and in the autumn, respectively; but in general when Hindus refer to the Navaratri, they refer to the Sharada Navaratri, which is observed sometime in the month of September or October, depending on the lunar calendar. Hindus believe that during the changing of the seasons there is enormous power going around in the universe to maintain balance and to sustain the changing climate, therefore it is at this time that there is a great sacred opportunity to call on the Goddess and to worship her. It is also during this time that people need a lot of energy and strength to survive the changing climate and that is why the Goddess is called upon to bless the people with the strength they need. Sculpture of goddess Durga in a public gathering at the time of Durga festival at Burdwan, West Bengal, India. The Navaratri festival honors the Mother Goddess Durga. She is also known under various other names: Parvati, Sakti, Uma, Kali, and Sati. In Sanskrit, Durga means “fort,” a structure that is highly protected and cannot be easily overturned. To Hindus, Durga is the almighty cosmic energy that creates, preserves and destructs the world. She is the representation of power and strength. She is probably the most important female deity of the Hindus. Hindu mythology tells of the story of Durga’s beginnings. It is said that Durga came about from the energy of all the gods in their quest to fight the demon Mahishasura, after he wreaked havoc on the world and gained victory over the gods. Every aspect of Durga comes from one god, her face, feet, her eyes, her hair, her teeth, and even her toes. All the energy of the gods combined and took the form of Durga. Each god also gifted her with a weapon, then using all these she went into a long and fierce battle with Mahishasura that lasted nine days and nine nights. In the end, she defeated the demon and the gods praised her and called her mother. 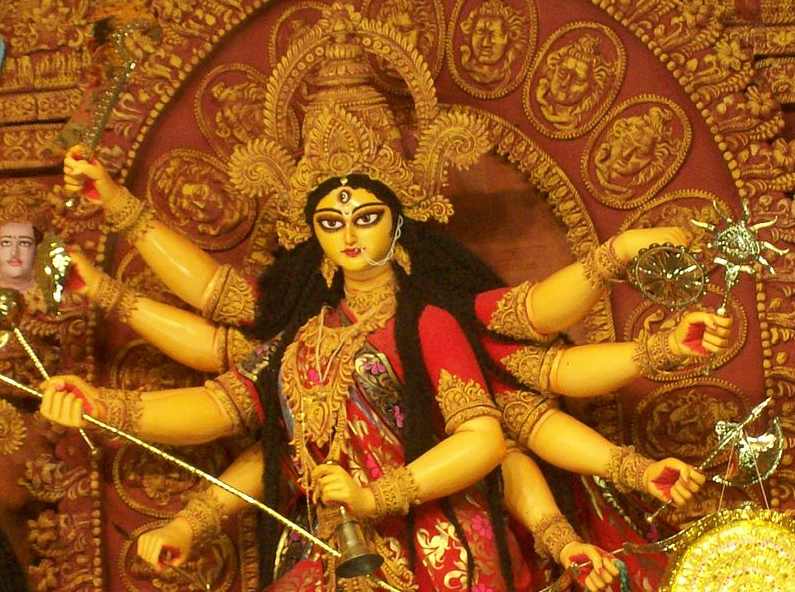 Durga’s image is characterized by her numerous mighty arms. In some images, there are eight arms, while in others, there are ten. The eight arms symbolize the eight quadrants of Hindu teachings. The number eight also symbolizes abundance in Hindu, which is a blessing provided by Durga. The ten arms, on the other hand, symbolize the ten directions: North, East, West, South, North-East, North-West, South-East, South-West, Zenith and Nadir. In each of her hands, Durga bears an item, each with symbolic meaning. · The conch represents the cosmic sound “Om,” which is the sound emitted when all sounds in the universe are combined, also referred to as the hum of the universe. · The bow and arrow are symbols of both potential and kinetic energy, and Durga’s holding both in one hand shows her control over both. · The thunderbolt symbolize firmness, decisiveness and confidence. · The spinning discus on Durga’s index finger while not touching it represents Durga’s command over the whole world. This is the weapon she uses to fight evil in order to build a world of righteousness. · The sword is the symbol of knowledge, which is as sharp as this weapon. The gleam of the sword indicates that knowledge is unquestionable. · The trident and its spears represent inactivity, activity and non-activity or the three kinds of misery (physical, mental and spiritual) which Durga has the power to eliminate. Durga is also depicted as having three eyes, which correspond to the moon (left eye) – symbol of desire; the sun (right eye) – symbol of action; and fire (center eye) – symbol of knowledge. Because she has three eyes, Durga is also called “Triyambake” which means Three-Eyed Goddess. Durga is normally portrayed riding a lion. The lion is a symbol of the qualities of power, will and determination, which are virtues that Durga possesses and uses to triumph over evil. The Mother Goddess Durga has nine incarnations. She takes on any one of the forms in her quest to fight demons and bring goodness to the universe, each one representing an aspect of life that needs to be addressed. Each day of the Navaratri is dedicated to honor one of Durga’s nine incarnations. · The first day is dedicated to Shailaputri. Her name means the daughter of the mountains as she is the daughter of Hemavana who is king of the Himalayas. She is depicted as having only two hands which carry a trident and a lotus, while riding a bull. · On the second day, the Hindus worship the Brahmacharini. Her name refers to someone who is very pious. She is depicted as holding a rosary and a water vessel. She brings happiness and peace, as well as wisdom. · The third incarnation of Durga and honored on the third day of Navaratri is Chandraghanta. Her name means “half-moon” (chandra) and “bell” (ghanta) because of the figure on her forehead. She embodies peace and prosperity. She is depicted as having ten hands, with weapons. She also has three eyes and rides a tiger. She also possesses the qualities of bravery and strength to fight wars against evil. · The fourth form of Durga is Kushmanda. The meaning of her name can be broken downs as follows: Ku means “a little,” ushma means “warmth” and anda means “cosmic egg.” She is honored as the creator of all things and has control of the solar system. Her image has eight to ten hands, with weapons, rosary and a lotus. She also rides a lion. · Skanda Mata is the honored on the fifth day. She is the mother of Skanda, the commander in chief assigned by the gods to fight the demons. She is usually pictured carrying the baby Skanda in one of her arms. Her image is characterized by four arms, holding a lotus in two of them. · On the sixth day of Navaratri, the Hindus honor Katyayani. The sixth form of Mother Durga is known as “Katyayani,” who is worshipped on the six day of Navaratri. Katyayani is a blessing by the Mother Goddess to a great sage, Kata, after he wished to have a goddess daughter. And thus, Katyayani was born. She carries a lotus and a weapon on two of her four hands. She also has three eyes and rides a lion. · The seventh day is dedicated to Kalrati. She is distinguished by her dark skin and fierce looking eyes. She is adorned with a necklace that flashes lightning. She rides on a donkey. She is worshipped as the slayer of darkness and ignorance. Her fearless pose and blessing hands is a sign of protection. She is also referred to as Shubhamkari which means someone who does good. · On the eighth day, the Hindus honor Maha Gauri, meaning tremendously white. She embodies purity and compassion. Her image is that of a calm and intelligent deity. She is often dressed in white or green and is atop a bull. She carries a trident and a tambourine. She has the power to eliminate to cleanse and eliminate past sins. · The ninth form of Durga is Siddhidatri. She has mystic healing powers and brings all the siddhis. She is worshipped by all gods, including Shiva. It is believed that when she blessed Shiva, he gained all the siddhis and half of his body took on a female character, while the other half was male. This was the birth of Ardhnarishvara. Siddhidatri is characterized by four arms. Some images depict her as riding a lion, while some put her atop a lotus. · The last day of the Navaratri celebrations was recently added to celebrate the victory of good over evil. It is referred to as Dasera or Day of Victory. Each region of India celebrates Navaratri in a different way, but one thing is for sure, all the celebrations are rich in tradition. 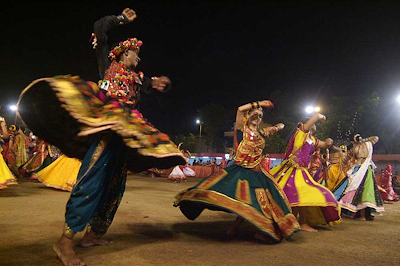 In the western part of India, the states of Gujarat and Maharashtra celebrate Navaratri with the traditional dance known as Garba, where massive groups gather in a single venue garbed in their most colorful saris to participate in the dance. In Mumbai, Hindu communities also celebrate with much dancing. Up to 3,000 elaborately dressed people gather in areas and participate in the Dandiya-Raas. These days, such events charge participants for tickets to join in the celebration. 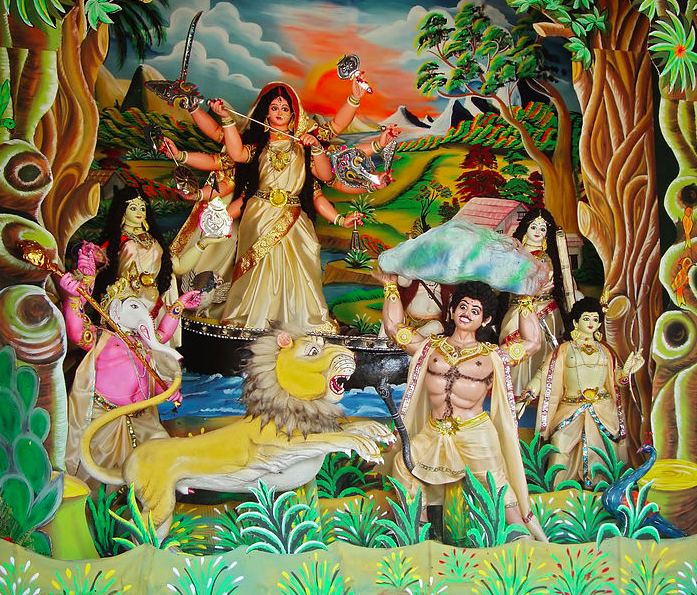 In Bengal, life-size images of the Mother Goddess, usually portraying her slaying of Mahishasura, are worshipped in temples and other locations. On the tenth day, these images are brought into the streets for dancing and major celebrations. Painted claypots with water or holding a lamp are used to represent the Goddess’ power in Gujarat. The flame represents eternal divine power while the water symbolizes the transitory nature of the spirit. Mysore is also famous for its Navaratri festivities with parades and procession of the deities’ images along with decorated animals and music bands. In Kerala, the celebrations are focused on books. The tenth day of Navaratri is considered an auspicious day to teach children to read and write. In Karnataka, people worship equipment that they use in their daily lives such as plowing tools for farmers, and vehicles for transportation workers. All these things are decorated with flowers as part of the worship. Here, Hindus believe in the need to perceive the divine in such inanimate objects. In Northern India, the commemoration of Navaratri takes on a more sober turn by the observance of fasting, which is believed to be a means of purification. Like in most celebrations, food can never be out of the picture. During the period of Navaratri, Hindus prepare a special selection of dishes, particularly for those who are fasting. For those who do not observe fasting, great feasts are prepared throughout the nine-day celebration. It is interesting to note the differences in the way people of one religious belief commemorate a religious festival. For some, there is great festivity; even shopping is included. For others, Navaratri is a time for reflection and purification. But whichever way a Hindu chooses to celebrate the Navaratri festival, they all share the same intent, which is to pay homage to the Creator and to ask for blessings. And this is pretty much something that we all could relate to, as well, no matter what religious beliefs we uphold. 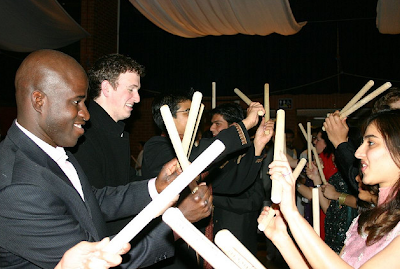 In English, we’ll greet them with “Happy Navaratri” but in India and in the rest of the world, there are many other ways to greet one another during this auspicious festival. - Sculpture of goddess Durga in a public gathering at the time of Durga festival at Burdwan, West Bengal, India.